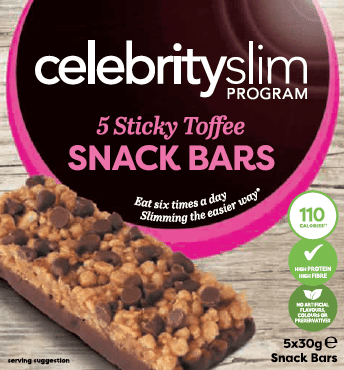 The delicious Sticky Toffee Snack Bar is dipped in milk chocolate and packed with toffee pieces, making it the perfect snack to sweeten up the day and satisfy those chocolate cravings! 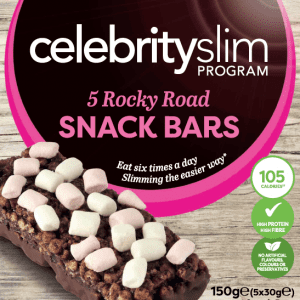 The Celebrity Slim Snack Bars are portion controlled and you can have up to two per day as an approved snack on the Celebrity Slim Programme Trim phase. 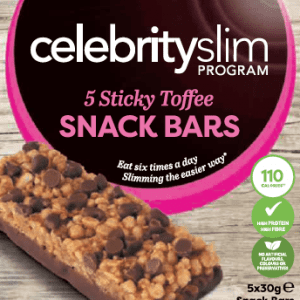 Directions for use: Celebrity Slim Snack bars are designed to be used in conjunction with the Celebrity Slim Programme. 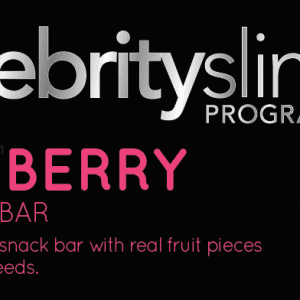 Each Snack Bar constitutes one allowable snack on the programme. Soya Crisps (Soya Protein, Tapioca Starch, Salt), Oligofructose, Milk Chocolate with Sweetener (13.3%) (Maltitol, Cocoa Butter, Whole MilkPowder, Cocoa Mass, Emulsifier (Soya Lecithin), Flavours), Glucose Syrup, Marshmallows (5.0%) (Glucose-Fructose Syrup, Sugar, Gelatin, Maize Starch, Colourant (Beetroot Red), Flavour), Sugar, Rice Crisps (Rice Flour, Wheat Gluten, Sugar, Wheat Malt, Glucose, Salt), Corn Flakes (Corn, Sugar, Salt, Barley Malt), Skimmed Milk Powder, Humectant (Glycerol), Milk Protein, Shortcake (1.7%) (Wheat Flour, Vegetable Fat (Rapeseed, Palm Oil), Sugar, Salt, Sodium Bicarbonate, Ammonium Bicarbonate), Low Fat Cocoa, Sunflower Oil, Flavours, Cocoa Butter, Raspberry (0.4%), Whole MilkPowder, Cocoa Mass, Emulsifier (Soya Lecithin). Soya, Milk, Wheat, Gluten, Barley.